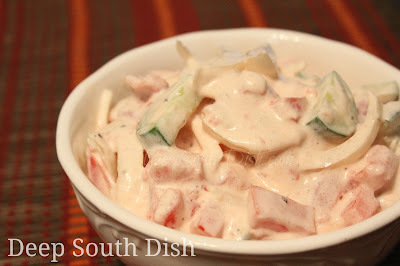 Creamy Cucumber and Tomato Salad with Onion. Thick cut slices of cucumber, with sweet onion and fresh tomatoes, mixed with a mayonnaise, sour cream and fresh herb dressing for a creamy cucumber salad. Fall arrives, well officially, in just a few days on September 23rd this year. Where has the year gone? I can't believe the holidays are just around the corner, but what I can't believe even more than that, is I have almost all of my Christmas shopping done! That folks, is a first for me. I have literally been out on Christmas Eve on more than a few years before y'all. I got an early start this year though, because with three grands, I need to stretch the budget out a bit more these days! Except for a few occasional teases, there won't be much in the way of fall temperatures around South Mississippi for awhile yet though - maybe October if we're lucky. It's still full blown summer for us... though generally milder and maybe a little less humid on some days. Some of my flowers are beginning to bounce back, so that's a good sign that the heat wave is easing a bit! When the weather is warm around here, there are two things you will almost always find in my fridge - watermelon and some kind of cucumber salad - and that hasn't slowed down. There's a dysfunction in my hypothalamus (which I'm sure is way more than you probably ever wanted to know about me), so I get overheated super easy in the summer, and those are two cooling foods that I know will help to keep my body thermostat in check. So... in the midst of these still summer-like temps, and before soup, stew, chili and gumbo weather arrives, I'm gonna slide in another one of my favorite cucumber salads that I've been munching on for the past few weeks. Truth is, I guess you hardly need to have any recipes for cucumber salads really - just throw together a few common things and there you go. Still, it helps to iron down some ratios for where you started, and then if you like it, you know exactly where to go the next round. Just a change here and there - a little mayo or a lot or none, a lot of vinegar versus a little, a lot of sugar, a little or even none - can really make a big difference in the flavor, which makes ratios in a recipe helpful. Fair warning. I am a mayonnaise lovin' southerner and this dressing is an even distribution of mayo and sour cream, so you definitely have to enjoy the flavor of mayonnaise to enjoy this dressing. For me, it's just delicious, so if you don't care much for mayonnaise, this one is not for you, unless you make those appropriate substitutes for said mayonnaise that you already know you love. Lower fat mayo and sour cream work fine here too. What differs this salad from others, is that I cut both the cucumbers and sweet onion - Vidalias when they are in season of course - on the thick side, I use very little vinegar and no sugar at all in this one, and I like to allow the juices of the tomatoes to mix and meld in with everything a few hours before consuming. I wrote this recipe for four servings, but it's very easy to just double for a few more. Here's how I make it. See more of my favorite cucumber salad recipes on Pinterest! In a medium storage or serving bowl, whisk together the mayo, sour cream, cider vinegar, salt, pepper and herbs, if using. Add the cucumber, onion and tomato, with its juices; toss. Cover and refrigerate for several hours to allow flavors to meld. Makes about 4 servings - increase as needed. My kind of salad. Love mayo, sour cream and onions. I just moved to a new house about an hour and half south of our old one to be near my daughter and her family. I can't wait until next spring so I can plant a vegetable garden. There's nothing like FRESH vegetables. Hopefully, there are not any deer or as many other varmints here as there were in Charlottesville. Can't believe the summer is almost gone although we also are still experiencing summer-like temps. I am so ready for some sweater and soup weather! Congrats on your move Tricia! We actually did that too a little over a year ago. We have 3 grands and since the move to be closer to them, we've seen and spent more time with them than all of their lives! It's been great!! I have made this for 2 potlucks and it was devoured made the3rd tonight for tomorrow per request. I'm so glad everyone has been enjoying this salad & thanks so much for taking the time to let me know!